Located southwest of Lundar, the ranch is over 12 square miles of privately owned Canada goose sanctuary. The sanctuary started off with 12 birds in the early 50's and it now sees upward of 10,000 birds every year, including 3 to 5 thousand goslings. The geese arrive in March and leave in November. Lawrence King, photographer and videographer, has looked after the area full-time since 1947. He was initially hired as a hunting guide and was kept on to feed and care for the geese. Lawrence was an avid hunter. King’s photos were used as colour studies for Lundar’s hand painted Canada goose statue. 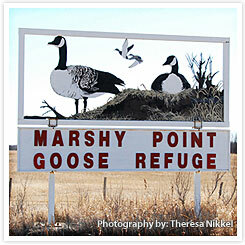 East Meadows Ranch is an integral part of the Marshy Point Goose Refuge.